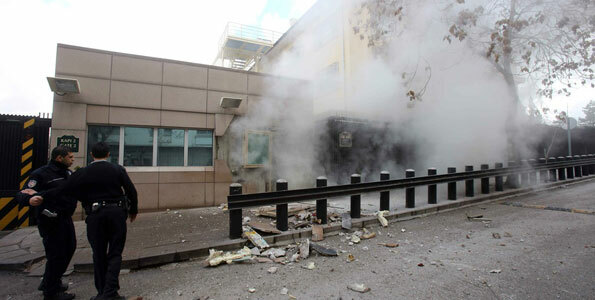 NATO Secretary General Anders Fogh Rasmussen "strongly condemned" a bomb attack Friday on the US embassy in Turkey. "I strongly condemn today's bomb attack on the Embassy of the United States in Ankara, which killed and injured a number of people," Rasmussen said in a statement. "This is an outrageous attack on the diplomatic premises of one Ally, on the territory of another Ally. It shows a reckless disregard for human life and for the inviolability of diplomatic staff," he said. A suicide bomber suspected to be a member of a radical Marxist group blew himself up at the US embassy in Ankara, killing a Turkish security guard and wounding three other people, officials said. Rasmussen said: "I offer my sincere condolences to the families and loved ones of the victims, and I express my full solidarity with the governments of Turkey and the United States. "There is no justification for such acts of violence. Terrorism in all its forms and manifestations can never be tolerated." The bombing at the entrance to the highly-fortified embassy in an upmarket area of the Turkish capital was the latest in a series of attacks on American missions in the Muslim world, highlighting the vulnerability of the country's 70,000 diplomats.